Climbing in Meteora is scary, beautiful and adventurous! The rock is very unusual and has not a lot of features, except of lots and lots of pebbles sticking out of the wall. Most climbing is slab climbing on these round pebbles and a good foot technique is more important than raw finger strength. The majority of routes are long multi pitch routes of several hundred meters length. The protection is very bad, and only a few rings protect the climber. This gives the climbing routes in Meteora an adventures feeling and the views from the top are always aspectual. 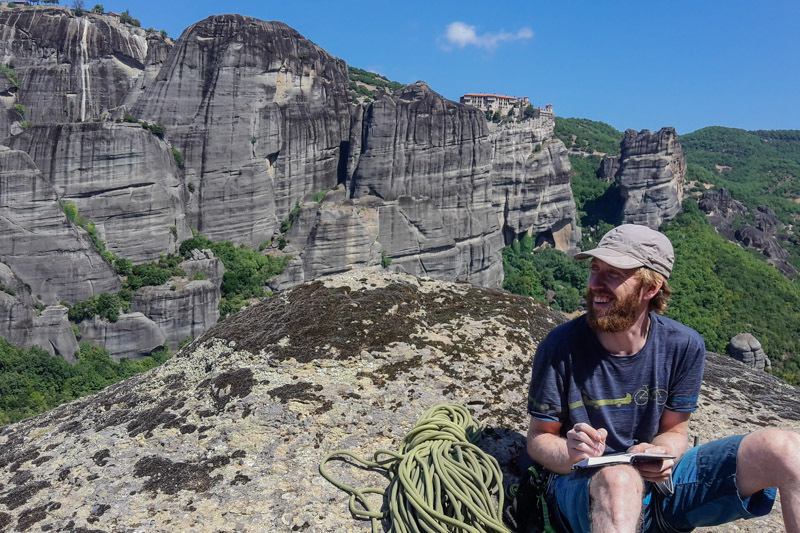 You can find more about our adventures in Meteora in our blog-post. Arriving at Meteora left us speechless. All these rock formations look like from another world. Rock and routes: The rock is very unusual: It consists of more or less featureless walls covered with lots of pebbles. These round pebbles are used as hand and foot holds and a good foot technique is important. Some of the pebbles can also be loose, so be careful. The protection is very bad and on easier routes the main difficulty is the mental challenge. On some routes are only 2 or 3 rings on a 30m pitch. 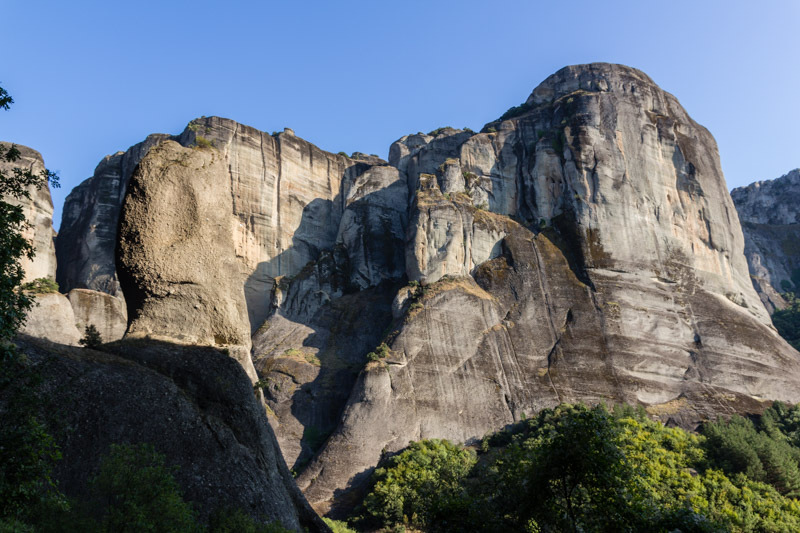 Climbing area and environment: The Meteora rock formations seam to be out of another world. These massive rocks seam to grow out of the ground and on top of them are several monasteries. It can be a long confusing hike to get to the climbing areas, but if you make it to the top the views around you will be spectacular. Guide book and information: There are several guide books for Meteora, but none of them are great. The guidebook ‘Greece Sport Climbing: The Best Of’ by Aris Theodoropoulos is the best book, which shows clear photo topos and approach paths. Unfortunately, it only covers a tiny fraction of all the climbing routes in Meteora. The second book we used was ‘Sport Climbing Guide Meteora and Theopetra’ by the local hero Vangelis Batsios. This book gives a good selection of the sport climbing routes, also including the neighbouring area of Theopetra. You can get this book directly from Vangelis at the Taverna Paradisos. There are two more ‘old’ books by Stutte and Hasse called ‘Meteora Band I and II’. These books cover all different climbing routes and also hiking paths. However, they include old school sketch topos, which are difficult to read and use. Mostly easy grades, but the grades usually don’t matter here. The climbing is so different and you have to be a good slab climber with a strong head to be able to enjoy the routes. Summer might be too hot, but you can always find something in the shade. Spring and autumn are the perfect season. Climbing in Meteora is always and adventure and it is not so much about the climbing itself, but the adventure on the rock. Accommodation: There are lots of accommodations around Meteora including several campsites. We stayed first at ‘The Cave’ campsite, but we cannot recommend this place as the owners were extremely unfriendly and we left. The campsite ‘Vrachos Kastraki’ (www.campingkastraki.com) is much better and preferable! Access to food: The next bigger supermarket is about 3km away and you have to cycle over one hill. Not the easiest access, but doable. Access to water: Clean running water at the campsite. 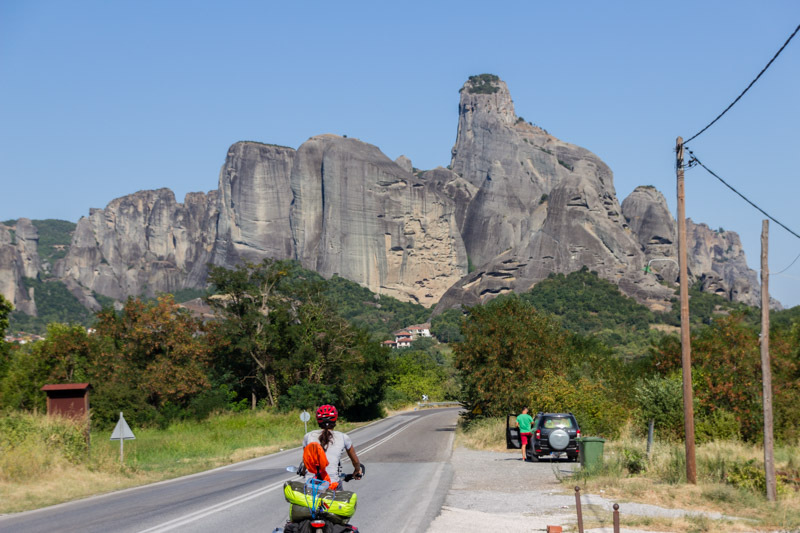 Access by bike: Getting to Meteora by bicycle can be a bit difficult, depending from which direction you come. If you come from the south, it is mostly flat, but we arrived from the hilly north. Meteora itself is very hilly and it can be exhausting to reach certain climbing areas. More views of these beautiful rock formations in Meteora. Climbing these walls is always an adventure.